Research shows that 80 per cent of property investors are failing to take advantage of depreciation deductions. Residential and commercial property owners are often unaware of the tax deductions they can claim relating to depreciation. The Australian Taxation Office (ATO) allows income producing property owners to claim depreciation due to the wear and tear that occurs to the structure of the building and the plant and equipment assets contained. 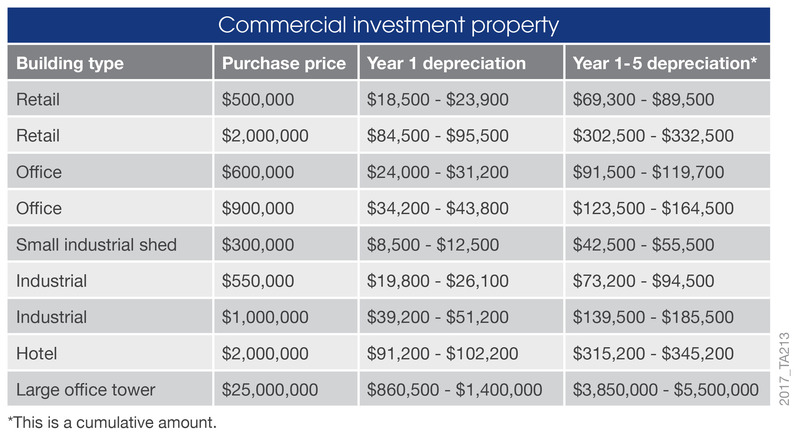 Investors do not have to spend money to be eligible to claim depreciation. As a non-cash deduction, depreciation is often missed. Richardson & Wrench aim to ensure owners of commercial and residential investment properties are maximising their cash return. We have a relationship with BMT Tax Depreciation, who specialise in property depreciation for all kinds of properties including residential, hotels, offices, industrial, agricultural, retail and medical buildings. BMT can provide a comprehensive tax depreciation schedule which will outline all of the deductions which can be claimed for any property. Why will depreciation help you save thousands? As a Richardson & Wrench client, you will receive a special reduced fee. For a free assessment of the likely deductions to which you are entitled, call and speak to one of BMT’s expert team on 1300 726 728 today. To learn more about property depreciation and discover what you can claim, select the links below to read further information and articles or watch educational videos.